University of Michigan Press, 9780472114009, 448pp. "Scrupulously researched, critically acute, and written with care, Playing Underground will become a classic account of an era of hard-won free expression." "At last---a book documenting the beginnings of Off-Off Broadway theater. Playing Underground is an insightful, illuminating, and honest appraisal of this important period in American theater." "An epic movie of an epic movement, Playing Underground is a book the world has waited for without knowing it. How precisely it captures the evolution of our revolution! I am amazed by the book's scope and scale, and I bless its author especially for giving two greats, Paul Foster and H. M. Koutoukas, their proper, polar places, and for memorializing such unjustly forgotten masterpieces as Irene Fornes's Molly's Dream and Jeff Weiss's A Funny Walk Home. Stephen Bottoms's vivid evocation of the grand adventure of Off-Off Broadway has woken and broken my heart. It is difficult to believe that he was not there alongside me to breathe the caffeine-nicotine-alkaloid-steeped air." Few books address the legendary age of 1960s off-off Broadway theater. 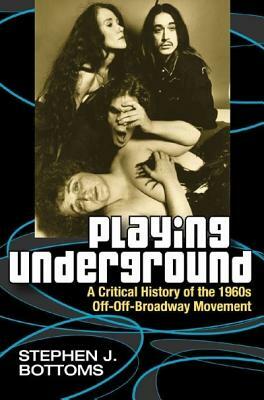 Fortunately, Stephen Bottoms fills that gap with Playing Underground---the first comprehensive history of the roots of off-off Broadway. This is a theater whose legacy is still felt today: it was the launching pad for many leading contemporary theater artists, including Sam Shepard, Maria Irene Fornes, and others, and it was a pivotal influence on improv comedy and shows like Saturday Night Live. Off-off Broadway groups such as the Living Theatre, La Mama, and Caffe Cino captured the spirit of nontraditional theater with their edgy, unscripted, boundary-crossing subjects. Yet, as Bottoms discovers, there is no one set of truths about off-off Broadway to uncover; the entire scene was always more a matter of competing perceptions than a singular, concrete reality. No other author has managed to illuminate this shifting tableau as Bottoms does. Through interviews with dozens of the era's leading playwrights, performers, directors, and critics, he unearths a countercultural theater movement that was both influential and transforming-yet ephemeral and quintessentially of its moment. Playing Underground will be a definitive work on the subject, offering a complete picture of an important but little-studied period in American theater. Stephen J. Bottoms is the Wole Soyinka Professor of Drama and Theatre Studies at the University of Leeds. He is the author of Albee: Who's Afraid of Virginia Woolf? and The Theatre of Sam Shepard: States of Crisis.